Franchise sidequels are a risky venture but Ocean's 8 proves Sandra Bullock, Cate Blanchett, Anne Hathaway, and their band of merry thieves can steal the show -- especially in 4K Ultra HD Blu-ray! Director Gary Ross keeps an eye on the show-stopping glitz and glamor of the Met Gala while never losing focus what amounts to being a clever and humorous heist flick that sits nicely alongside the previous trilogy. Warner Bros. gives the film a beautiful 4K Dolby Vision presentation that offers up a clear improvement over its 1080p counterpart with a terrific audio mix to match with a halfway decent assortment of bonus features to accessorize this great release. If you enjoyed Clooney and his boys give Bullock and her gals a shot. Ocean's 8 is just good popcorn fun. Recommended. Oceans 8 steals the show on 4K courtesy of Warner Bros. in a two-disc 4K Ultra HD Blu-ray + Blu-ray + Digital set. The film is pressed onto a BD-66 disc and is housed in a black eco-friendly case with identical slipcover artwork. The disc loads directly to a static image main menu with traditional navigation options. All bonus features are only present on the standard Blu-ray disc. The included digital copy redeems 4K through Movies Anywhere. Sandra Bullock and her crack crew of damsel thieves fit nicely within the cinematic world started by Steven Soderbergh and George Clooney 17 years ago. As a sidequel of sorts, Oceans 8 lets a couple familiar faces come and go while allowing the new cast and crew under the helm of writer and director Gary Ross show they're up to the challenge of pulling off a fun heist flick. There's plenty of room and reason to enjoy this entry and hopefully a couple more adventures with this new team of thieves. 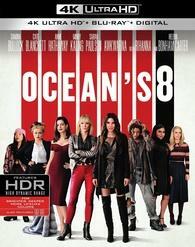 Warner Bros. delivers a beautiful 4K Ultra HD Blu-ray release of Ocean's 8 with a sparkling 2160p Dolby Vision transfer and a lively and effective Dolby Atmos mix to match. While they may not be plentiful, the bonus features are pretty decent. If you're in the mood for some easygoing popcorn-munching fun, give this a spin. Recommended.